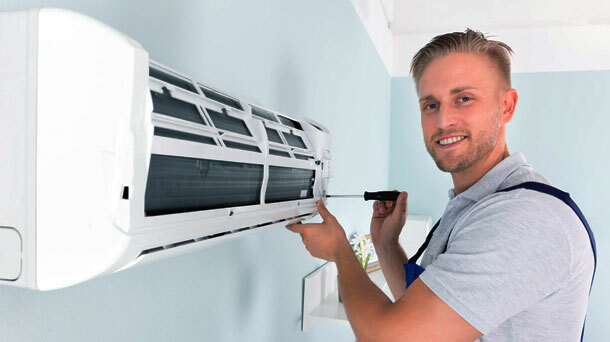 Ductless mini split systems are the ideal cooling and heating solution for installations, where adding duct work is impractical or too expensive. The matched combination of indoor air handler and outdoor condenser is efficient and easy to install. Some buildings need commercial ductless air conditioning systems, while homes would utilize multi-room and single-room ductless mini split air conditioning or heat pump systems. 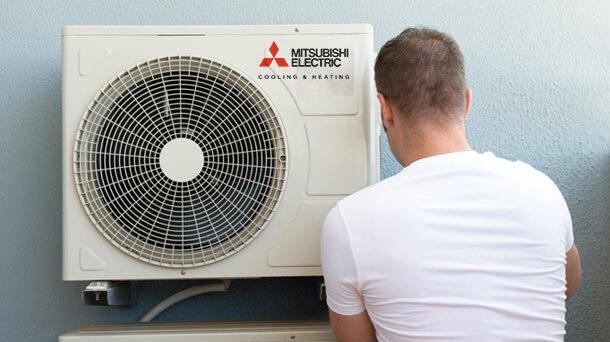 Ductless mini split systems by Mitsubishi Electric reduce energy consumption in your home, which means leaving less of a footprint on the environment while saving energy and money on your utility bill. No two homes are alike. Yet conventional cooling and heating systems all apply the same method – where whole home is controlled by one, or two thermostats. Consequently, some areas of the home are never comfortable, and rooms become unusable in extremely hot or cold weather. Mitsubishi Electric cooling and heating ductless systems let you to adjust your comfort settings to meet your family’s unique needs. You and your family will not need to change the way you live to match the weather patterns. Enjoy every room in your home, all year round, with personalized comfort, in any season! Ductless systems provide energy efficient and unique comfort, pollution filtration, and precise control, all without the noise of conventional systems. Indoor units operate extremely quietly. They get as low as 19dB. This is similar to the sound made by tree leaves in a light breeze. 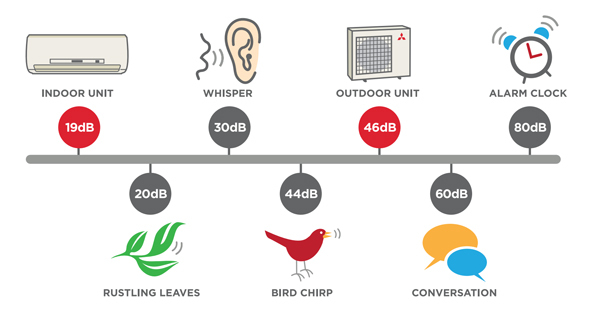 Outdoor units operate at levels as low as 58 dB(A) – the level of a common office environment, quiet restaurant conversation or background music. Ductless mini split systems provide cooled and heated air directly to the rooms they serve, without the need for noisy fans. There are only three major components – the indoor unit, the outdoor unit, and the remote controller. This means the ductless system can be installed quickly and without major construction. The end result is a quiet, efficient and practical cooling and heating system. If you live in a colder climate, you have suffered through the sound of an overworked furnace or heat pump. The new Mitsubishi Electric H2i® Hyper-Heating INVERTER systems deliver consistent and efficient heating in the coldest of temperatures, even when the when outside temperature drops to -13° F. The Hyper-Heating ductless mini split system keeps the house comfortable and quiet, even on the worst winter days. Enjoy the quiet comfort, and get focused on what matters the most, while leaving cooling and heating to experts! Ductless mini split systems allow complete remote access and control, whether you’re at home, work, or anywhere in the world. With several options to choose from, you can personalize your own remote control, giving you the power to adjust your settings based on what’s happening indoors or outdoors all from the devices you use the most. 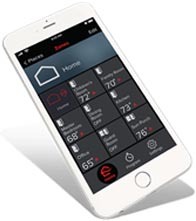 The optional wireless interface is used with the kumo cloud App to remotely control and monitor your Mitsubishi Electric M-Series, P-Series, and CITY MULTI indoor units. Remotely monitor and control your ductless mini split system any time, any place, using your computer, phone, or tablet. The app is free to download from iTunes and requires no monthly fee. Adjust your settings so that your home is has perfect temperature when you return home. Keep your kids comfortable after school, pre-warm your bedroom for the night, or adjust your set temperature in response to the outdoor temperature changes. No need to control your home’s temperature from a single thermostat. Instead, control each room individually. A ductless heating and cooling system is the perfect choice for homes with limited space and unique designs. Invest in a ductless system and enjoy great comfort without the need for major home renovations and repairs! 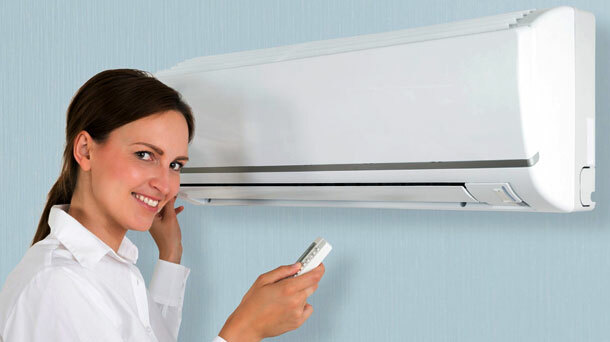 Enjoy benefits of an energy-efficient, environmentally-friendly and completely customizable ductless unit. Ductless systems offer easy installation, improved indoor air quality, flexible configurations, year-round comfort and more! Ductless split systems provide families with almost unlimited, customizable options that allow them to use every single room without the unsatisfying ‘hot and cold’ spots, improving comfort and reducing energy cost! 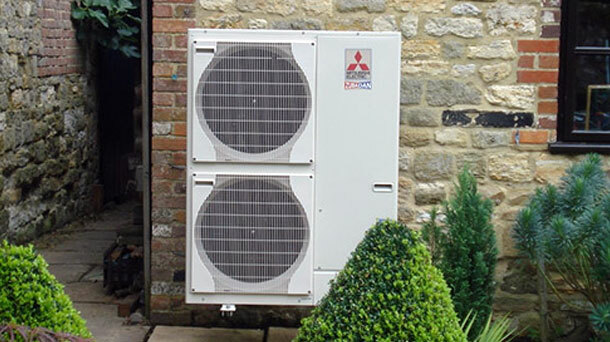 Hyper Heating is a significant advancement in heat pump technology. It is an excellent heating solution designed to keep your home comfortable during extreme cold climate condition. Our Hyper-Heating INVERTER Technology (H2i®) is designed to deliver consistent temperature and efficient heating, even under extremely cold temperature. Enjoy long-term comfort and savings with this technology. 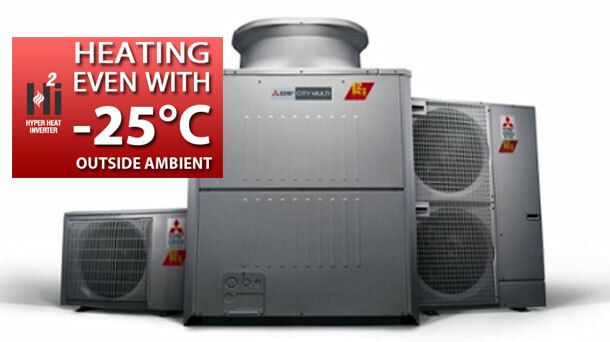 Enjoy optimum comfort with highly efficient and modern whole-home heat pump solutions. With ductless and ducted air handlers, meeting your family’s comfort needs is now made easier.